Measurements: Width 50cm, Depth 50cm, Height 50cm approximate. Pixels selection looks fantastic in any child's bedroom. 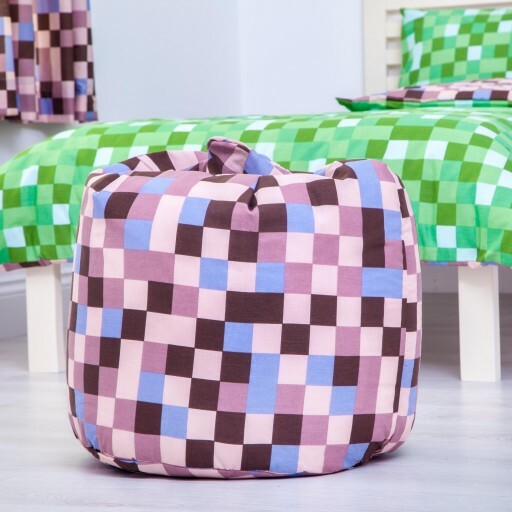 This beanbag is part of the wider collection which includes bedding and accessories for the whole room. Made from tough, durable fabric that is soft to the touch but won't let you down. The seams are extra secure to prevent leaking of the polystyrene bead filling. Fully tested and Fire Retardant. This items meets all current British Safety Standards. We only make our Bean bags in the U.K. Great for children of all ages.